If the familiar faces aren’t delivering, why not turn to some fresh faces, right? 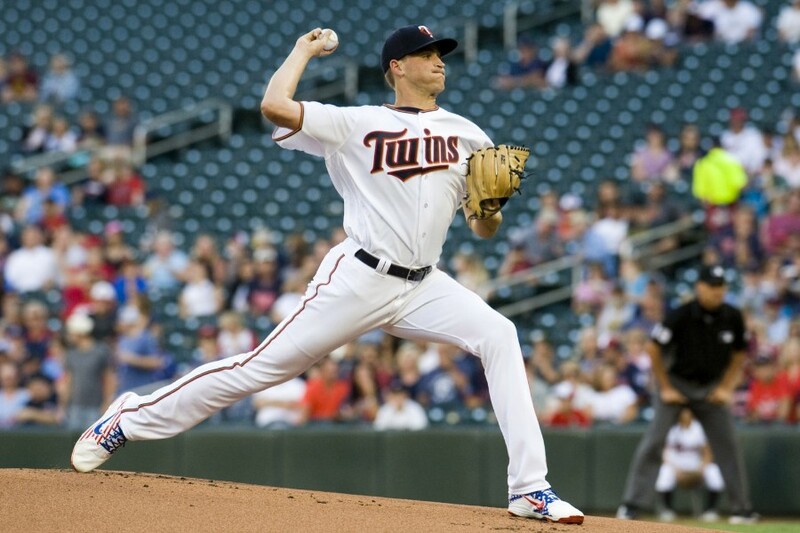 That plan worked out well Thursday night at Target Field, as Aaron Slegers held Baltimore to one run over six innings and Jake Cave was 3-for-3 with two doubles, a walk and an outstanding leaping catch. This is exactly the type of game we’ve come to expect from Slegers down in Triple A. He doesn’t overpower hitters (just two strikeouts) but he keeps them off balance. 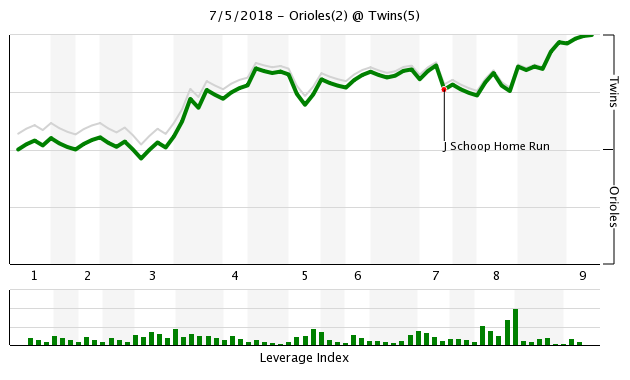 The Orioles only got one run off of three hits and a walk against Slegers, who only needed 72 pitches to complete his six frames. The Twins scored their first run in the bottom of the third thanks to a pretty comical error by the O’s. Minnesota took a 3-0 lead, but things tightened up again thanks to a pair of Jonathan Scoop solo homers — one off Slegers and the other off Addison Reed. Clinging to a one-run lead, Trevor Hildenberger pitched a scoreless eighth inning. The Twins added a pair of runs in the bottom half to take some of the excitement out of Fernando Rodney’s night. He pitched a perfect inning with a pair of strikeouts to earn his 18th save. There was a huge call overturned that hurt the Twins. Max Kepler hit what originally appeared to be a run-scoring double to put the Twins up 4-2 in the sixth. After a closer look, it was determined it was a ground-rule double. Jorge Polanco, who came around to score from first on the play, was forced to go back to third base, where he was eventually left stranded. Cave was the offensive star of the night, but Logan Morrison was 2-for-4 with his 10th home run and Kepler was 2-for-4 with a double. Whats the chances Slegers gets another start?What are the chances he's sent down tomorrow? Picked a great game to attend.Very entertaining and speedy.I am quickly becoming a Jake Cave fan. I was at the game with the family. Great night for baseball and the Twins won! I thought Slegers did a nice job today and deserves another shot. I didn’t get a chance to watch or listen to the game. When I looked at the box score, I was surprised that Slegers was pulled after just 72 pitches. Was he laboring or getting into some trouble in the later innings? I just hope he stays up. And Cave keeps starting. Was there a reason Slegers was taken out? Only 72 pitches? I like what this kid brings as a 5th starter. They were having better ABs the last couple innings. I think taking him out was motivated by making sure his confidence remained in tact. It was a good outing to build on and that was more important than getting one more inning. To me, Cave seems like a better option than Grossman.He can run faster, play all 3 outfield positions, and seems to take quality at bats. I guess that means Cave will be sent down today and Grossman will be in the starting lineup until a 40-year old journeyman outfielder can be signed (and probably Rooker DFA'd). An impressive starting pitching performance, a couple of player with multiple hits. Not a bad game! Then again, we were playing the Orioles. Whew! I was worried there. Just when I was beginning to think the Twins were a terrible team, the Orioles came to town and showed us what terrible really means.